Internal archdiocesan documents obtained by MPR News raise questions about what the University of St. Thomas knew about sexual abuse allegations against a professor in 2006. The documents show top church deputy Rev. Kevin McDonough investigated several allegations in 2006 that the Rev. Michael Keating sexually abused women and he planned to communicate his findings to an administrator at the University of St. Thomas. Keating, 57, is an associate professor of Catholic Studies at the University of St. Thomas and a priest in the Archdiocese of St. Paul and Minneapolis. He went on temporary leave Oct. 11. Three days later, a woman filed a lawsuit in Ramsey County accusing Keating of sexually abusing her in the late 1990s when she was 13 to 15 years old. Keating did not respond to requests for comment. On Thursday, his attorney, Fred Bruno, called the allegations in the lawsuit "false and highly defamatory." The woman's family first reported the allegations to the archdiocese in 2006. The archdiocese's clergy review board investigated and concluded in November 2007 that there was insufficient evidence of child sexual abuse. Nonetheless, it recommended to Archbishop Harry Flynn that Keating not be allowed to mentor teenagers and young adults. McDonough told Flynn in a March 13, 2008 memo that he would inform Don Briel, the university's director of the Center for Catholic Studies, of the conclusion of the Keating investigation. "To the extent that others in the University have to be notified, we should see to that as well," McDonough wrote. Keating's teaching of young adults at the university indicates that the board's recommendation was not followed. It's unclear whether Flynn rejected the recommendation and never passed it along to the university or if university officials knew of the recommendation and disregarded it. Reached at his office Tuesday, Briel wouldn't say whether he knew of the allegations. Flynn, who retired in 2008, and McDonough, who left his job as vicar general that same year, did not respond to interview requests. A university spokesperson wouldn't discuss the matter. This week, Julie Sullivan, the new president of the University of St. Thomas said the university will conduct an investigation of the allegations against Keating. In an email to St. Thomas community members, Sullivan wrote, "When a member of one's community is accused of wrongdoing, it can cause a host of reactions — denial, betrayal, confusion and sadness — often at the same time. I am praying for the woman who filed the lawsuit, for Father Keating and for our entire community, and I know many of you are, as well." The university's 44-member board of trustees includes two prominent clergy — Flynn and auxiliary bishop Lee Piche. Flynn is listed as the board's president. Another board member, McDonough, the former vicar general, resigned Oct. 4. 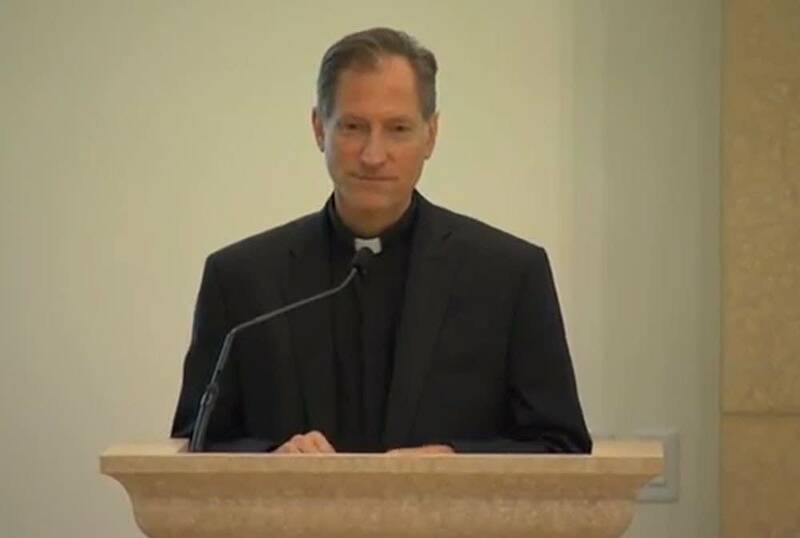 "He chose to resign so any question about his work with the archdiocese would not be a distraction to the work of the university," St. Thomas spokesman Doug Hennes said in an email Friday afternoon. The abuse claims first surfaced in 2006, when the woman's parents told the archdiocese and the Chisago County Sheriff's Office. The sheriff's office found insufficient evidence to file charges. The archdiocese conducted its own investigation of Keating from 2006 to 2008, documents show. Catholic dioceses in the United States follow a document known as the Charter for the Protection of Children and Young People, a set of procedures created in response to the clergy sexual abuse scandal in 2002. The Charter requires each diocese to have a review board, composed mostly of lay people, that provides confidential advice to help a bishop "in his assessment of allegations of sexual abuse of minors and in his determination of a cleric's suitability for ministry." The Charter also says a priest must be presumed innocent and if no abuse is found, "every step possible is to be taken to restore his good name, should it have been harmed." The Keating case went before the archdiocese's review board in 2006 or 2007. McDonough and an attorney for the archdiocese also investigated the claims. In November 2007, the archdiocese provided the alleged victim's father with a copy of the review board's findings and recommendations. It said, "Based on the record as a whole, the Board finds that there is insufficient evidence to support a finding of sexual abuse of a minor in violation of the Charter." Nonetheless, church leaders came away concerned about Keating, according to memos obtained by MPR News. In addition to restricting Keating's interactions with young people, the board said, "The recommendation is to be shared with the appropriate supervisors of the priest to permit appropriate levels of monitoring and compliance with it." The document does not name the supervisors. The parents of the young woman who filed the lawsuit this week told McDonough that Keating sexually abused their daughter when she was 13 years old, according to a Feb. 2, 2006 memo by McDonough to Flynn. The woman described an incident "which involved Michael Keating rubbing her chest for a prolonged period of time," McDonough wrote. As church officials investigated the initial claims, they uncovered other allegations. Another priest told McDonough that he thought Keating had "very emotionally intense and perhaps physically sexual relationships with two under aged young women," according to McDonough's Feb. 2, 2006 memo. One of the women lived in Italy and had met Keating when he was studying in Rome to become a priest. "A number of people have commented on the intensely connected emotional relationship that Michael Keating and [the girl] had, and a variety of kisses and other embraces that were publicly visible," McDonough wrote. "Archbishop, it is not clear at this point where all of this will go." Either Keating "has a deep inability to understand when a relationship with a woman has crossed emotional boundaries," or he committed sexual abuse, he wrote. McDonough advised against restricting Keating's ministry while police investigated. "The police will want to perform their investigation unimpeded," he wrote. "When they permit us to move ahead and speak with him, then I believe we will have to ask him to step back from his teaching." The Italian girl would later deny any sexual contact with Keating, according to church documents. An attorney for the archdiocese emailed her in Rome and she told him that Keating hadn't done anything inappropriate, the documents said. Regardless of whether Keating sexually abused children, McDonough wrote in a May 5, 2006 memo to Flynn and to other church officials, the priest had another problem. "That issue concerns an ongoing pattern of irresponsible seductiveness (non-sexual) in Father Keating's life." As part of the investigation, McDonough also talked to a woman in Michigan who described how Keating formed close relationships with herself and several other women. "He engages them in long conversations, provides little gifts, sends e-mails," McDonough wrote in a Feb. 3, 2006 memo to Flynn and a church lawyer. "This sort of behavior has come across to at least four or five women whom [the woman in Michigan] knows as something 'special' or 'romantic.'" McDonough wrote he didn't think the relationships were sexual. "I proposed to her the phrase 'inattentive seductiveness' and she said that she thought that was very accurate," he wrote. "She believes that, for his own reasons of emotional need, Michael Keating likes to have women in his life to whom he can pay a good deal of attention and who will pay attention to him." McDonough struggled to find any concrete evidence of abuse, as he explained in a Feb. 6, 2006 memo to archdiocesan attorney Andrew Eisenzimmer. "The people to whom I am listening have intense emotional and spiritual reactions to a whole variety of situations, and they express those reactions in great detail," he wrote. "When I try to get beyond the conclusions to the underlying facts, however, I am finding that there is relatively little there." It's not clear when — or if — the archdiocese reevaluated the board's recommendations on Keating. When the clergy review board initially recommended restrictions in 2007, it asked that they be reviewed one year after implementation. Editor's note: Mike Cronin contributed to this report. This story was updated at 6:40 p.m. on Friday, Oct. 18, 2013.